Following on from the wild success of the EFW Gallery Part 1 & 2, I'm overjoyed to unveil the 3rd part of the trilogy today. 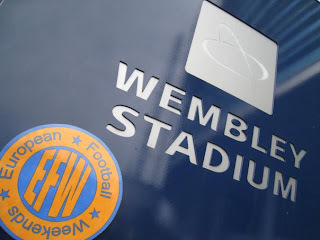 This is the part of the site whereby you and I photograph the EFW logo not only in our favourite football stadiums but also with *cough* A-list celebrities. In a phrase which is fast sweeping the nation due to it's (too many - Ed) mentions on this website 'What's not to like'!? So what are we waiting for....hey ho, let's go. I know what you are thinking. It can't be, can it!? It is you know. What better way to launch the hatrick of EFW galleries than with a little snap of 3 (three!) times World (world!) darts champion John Lowe!? John was the first chap to do a 9 dart finish live on the telly. He was photographed by Nick Waterhouse who told me that when he asked world champ Lowe for this photo he replied "What's all this then, football's barmy army!?". One hundred and eighty FIFA stars for the pair of them. 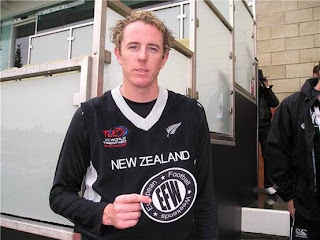 New Zealand legend Iain O'Brien took a break from the 2009 Twenty20 World Cup to hop on board the good ship EFW. O'Brien - who also pens a blog on the Cricinfo website - was snapped (again) by Mr Waterhouse. 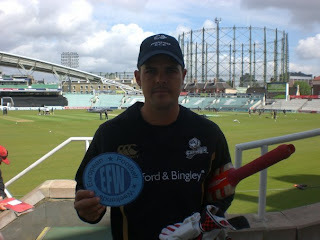 Yorkshire and South African cricket legend Jacques Rudolph snapped by Mr Lomas who also did..
Ex-England captain and Surrey cricketer Mark Butcher. Chris Adams. Ex-England International. 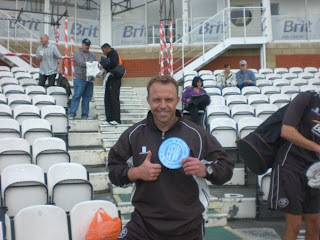 Won umpty thrumpty trophies as skipper of Sussex. Now cricket manager at Surrey. Extra EFW points are awarded for all concerned when thumbs are aloft and smiles are worn. 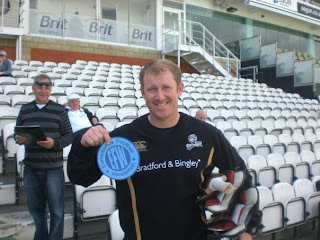 Ex-England International and current Yorkshire skipper Anthony McGrath. Angus Fraser. What the same Angus who used to bowl for England!? The very same one. Snapped here in the Lords Media Centre. Sky Sports Tim Abraham. Tim travels the world bringing cricket scores and reports to our tv screens. Having now met him - I can happily report - he is officially the nicest/friendliest bloke on the planet. 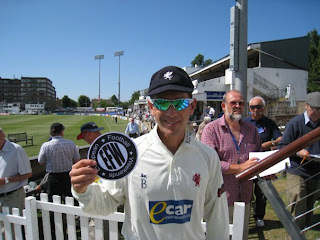 Somerset and Australian cricket legend Justin Langer. 105 Test matches for Australia at an average of over 45. Welcome to the EFW Hall of Fame Sir! 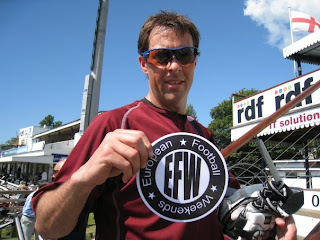 Somerset and England star Marcus Trescothick also joined the EFW team this month. With 76 test matches, 123 One Day Internationals and a best selling book under his belt we're delighted to have him on board. J-League representative Kaname from Kobe talked me into a beer after learning that Japan had qualified earlier that day by beating Uzbekistan 1-0 away. 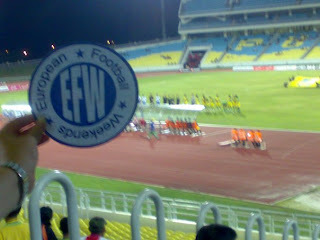 I still can't keep my eyes away from the beauty of the EFW logo. Qemal Stafa Stadium, Tirana, Albania - right in the middle of it. 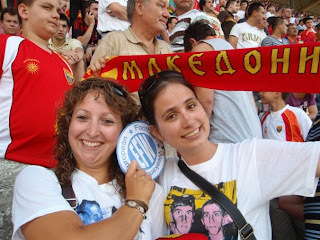 Qemal Stafa Stadium on fire, Tirana, Albania - woo-hoo! 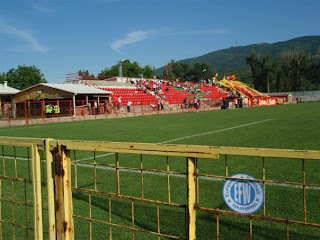 FK Makedonija Gjorce Petrov's ground, capacity 3,000, located in a western suburb of the capital Skopje. Note the conveniently located pitch-side pub on the left next to the stand (where the stewards hang out). 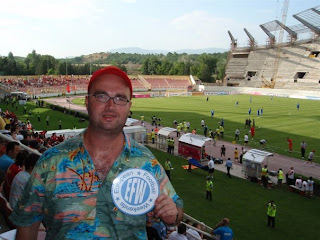 Gradski Stadium, Skopje, Macedonia - wearing my best shirt for this special occasion. 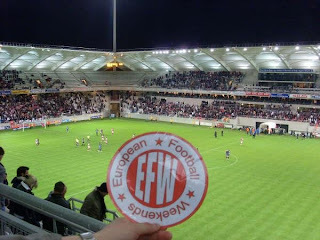 Newly recruited EFW members Lauranne and Desiree from Switzerland, caught on their amazing 8-month 'tribute to Riccardo & Alessio* tour' around football grounds in Europe. *Juventus youth team players (http://riccardoealessio.it/ drowned in a lake in December 2006 when trying to recover a football. 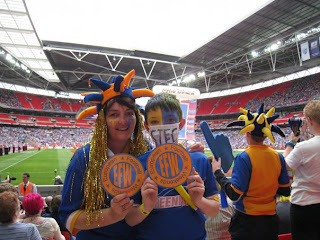 We were with Shrewsbury Town at Wembley for their play-off final with Gillingham. 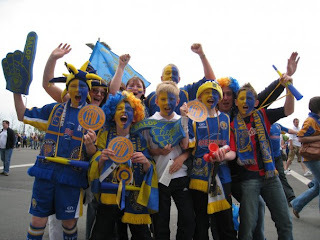 Town fans having the time of their young lives. 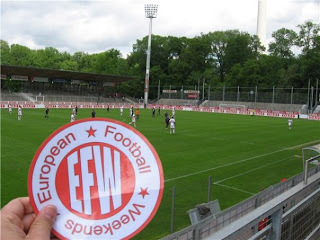 EFW Shrewsbury/Stuttgart branch enjoying a pre-match bevington or six. 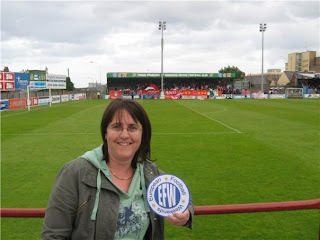 Debbie Shaw at United Park for the Drogheda Utd v St Partick's Athletic. The travelling St Pats fans are in the background. Evertonian Graeme Holmes at the same match. Our newest recruits from Spain. 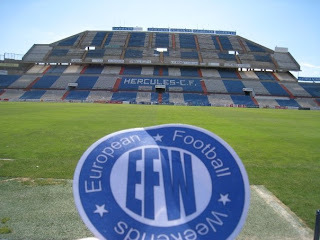 Alejandro and Carlos have vowed to launch the Spanish branch of EFW. This is my father-in-law in rare 'not on tractor' moment. 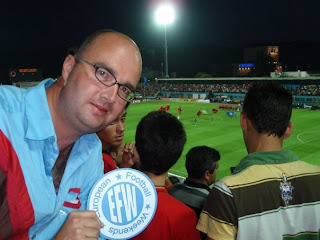 He lives in Salinas del Manzano, Spain and along with Sky Sports Tim Abraham is the nicest bloke on the planet. Talking of Spain. 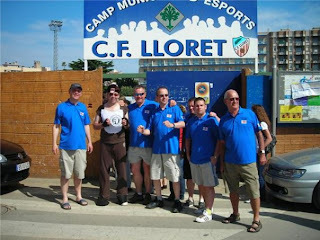 Here's the lads from Forest Green Rovers out at the CF Lloret v St Cugatfunfest. 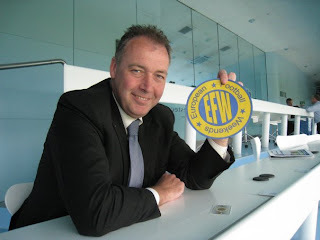 Darren Sheppard is seen here holding the EFW logo whilst dressed as a horse. 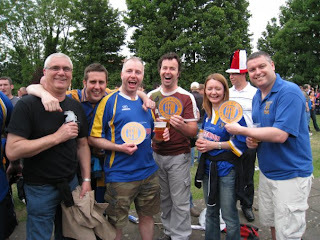 The club let the lads into the ground for free thinking - correctly - that they might drink a seasons worth of beers. What happens when you drink pre-match spirits Spanish style (ie with about a litre of whiskey in each glass)!? 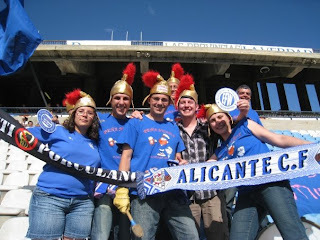 You jump in with the Alicante CF fans during the derby with Hercules and don a silly hat of course. Estadio José Rico Pérez home to both Alicante CF & Hercules CF - bit greedy eh!? 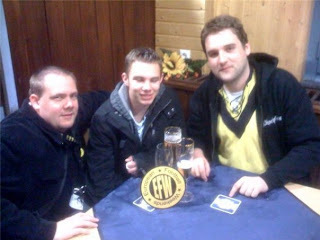 Thorsten, Philipp and Thomas - our mates from Dortmund celebrating BVB second teams promotion over a few German beers. Full marks for this effort from our good friend Michael Stoffl who resides in Berlin. 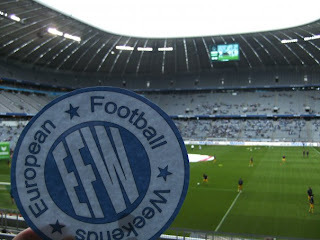 Stoffers is an 1860 Munich fan, hence the colour of his EFW logo. 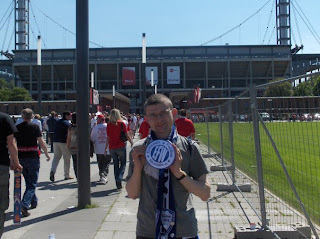 This was taken at the Stadio Atleti Azzurri d'Italia for the Atalanta v Palermo. ...and ending up at Cologne. Cheers Chris! Waldaustadion Stuttgart Stadium home to the famous Kickers Stuttgart in the German Liga 3 (for now) taken by Graeme Holmes. As above but with the two teams proudly marching out. 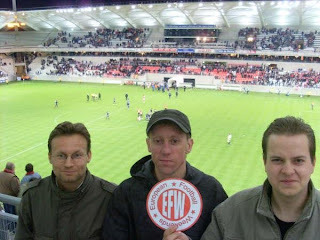 ...who is in the photo (far right) along with two of Antwerps finest; Roland and Frank. It's only chuffing Penang vs Kedah in the Malaysian Super League! 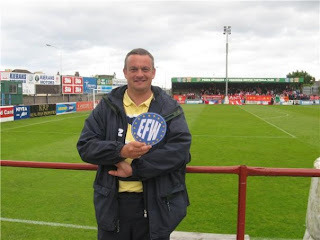 Cheers to Adrian Ludbrook who is going to be joining us on our EFW Oktoberfest by the way, everyone welcome. Also joining us will be Mr Challen who snapped these beauties. First up FC Ingolstadt v Rot Weiss Ahlen at the Tuja Stadion. 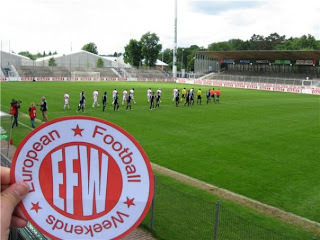 Then at Bayern Munich II v Kickers Emden at the Grunwalder Stadion. 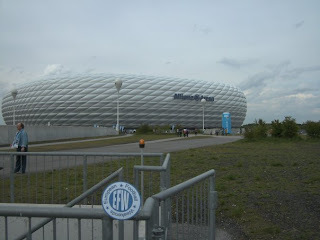 And finally outside the Allianz Arena before 1860 Munich v Hansa Rostock. That's all folks. Well nearly. 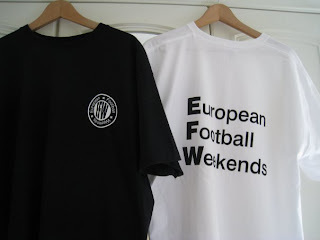 It would be remiss of me not to mention that we have a very limited number of EFW t-shirts left (see above). I had loads made up and they were nearly all sold without the need to advertise them on these pages. I do have a couple left though in either Black or White so if you are quick you may still be able to nab one. £12 each including postage to anywhere in Europe. 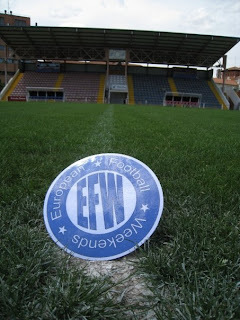 Want an EFW logo photographed at your club or on your travels!? Email me at dannylast@hotmail.com and we'll get it sorted. Fancy joining us for a trip!? Ever fancied joining us one one of our jaunts abroad!? Well, now you jolly well can. I'm proud to announced details of the very first 'EFW Oktoberfest'. We'll be meeting up in a pub near to Tilburg Railway Station in the afternoon for a few beers before boarding a train for the short journey (15 minutes) to Hertogenbosch for the Dutch 2nd Division game between Den Bosch and Fortuna Sittard. Back to Tilburg afterwards for a film in the local cinema....just kidding we'll be having a few more beers. 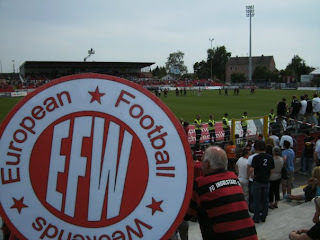 Saturday is now set aside for Rot-Weiss Essen v SC Preußen Münster. We'll be hopping over the border for Germany for this one. 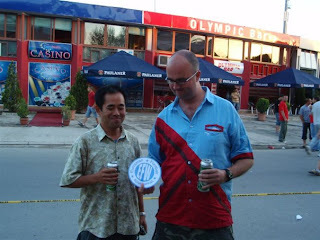 Seen as a local derby, fanatical fans, cheap beer, terracing for 18,500 and buttons to get in. 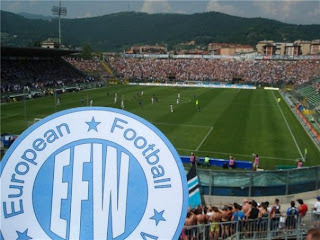 This looks like being a classic EFW day out! On Sunday morning we'll be actually playing a match. Don't worry, the quality will be shocking with the emphasis very much on just taking the micky out of each other and having a laugh. The match will be played on a ground in Tilburg, so bring some kit with you. We're hoping there will be enough numbers for this to be England v Europe. Early indications are that we'll have no problems getting the teams together. 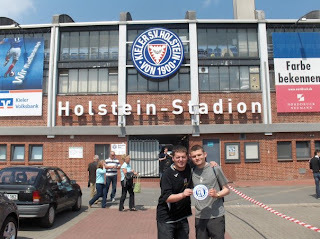 In the afternoon, seeing as we'll be in Tilburg, who fancies nipping downtown to watch Willem II v Heerenveen!? (yes please - Ed). Good news here is that I've negotiated us a group discount on match tickets and they will only cost us 15 Euros each. As one person put it to me this morning, that's cheaper than watching Forest Green Rovers! For the record. We are flying out on Friday morning from Gatwick to Amsterdam. We're leaving on a BA flight 09:20 which arrives at Amsterdam on 11:35. So we should be in a Tilburg pub for around 14:00 at the latest. We're flying back from Amsterdam on Sunday evening at 21:30 with Easy Jet. There is an excellent (user friendly) Dutch train timetable - click me for Dutch train times. These two are in the street where the station is and close to the centre. This one 'Mercure Hotel' is just in the middle of the nightlife. This one is only cheap if you go and sleep with more people in one room 'Hotel Lindeboom' and it's in the street where the best pubs are. Our hotel at Central Tilburg works out at 30 Euro a night for a room with 4 people and it's right next door to the station. 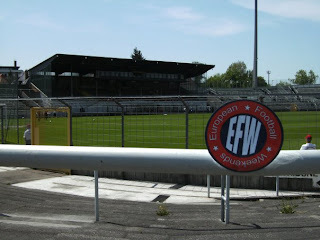 More details and discussion boards can be found on our European Football Weekends Facebook site which you really should join if you haven't already. Ask any questions you may have on there or email them direct to me (dannylast@hotmail.com). Please confirm as soon as possible if you fancy coming so I can sort out match tickets. I know, I know: 'there is more to life than football Danny Boy', for example cricket. I don't like cricket - oh no - I love it and what's not to like about four of the best teams in the world pitching up at The Oval for a day of hit and giggle!? Now, if you and I were to meet in a posh hotel over a large port or two and put on our (slightly posher) cricket voices for the afternoon, I'd probably drone on about the fact I like my cricket best served over 5 days in the form of a test match. However, I do accept that when Chris Gayle plunders 27 runs in one Brett Lee over that you, me, Paul Weller and every man and his dog are entitled to scream 'that's entertainment'. 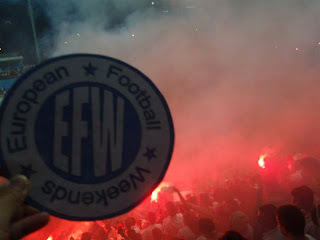 So how did EFW and BIR end up having our end of season work do here!? Well, EFW and BIR are owned by the GTC (media group). The ICC after consultation with the ECB decided to let EFW and BIR join the likes of the BBC, TMS and SSN and issued us all with some press passes. Simple as really. Press Box 11? Don't mind if I do. Upon entering the media section at The Oval I was told that the actual press box was full and as a result I'd be in the overflow area which turned out to be press box 11, pretty much the best seats in the house. Free food and drinks, desks and a window that opened out onto our own balcony. Nice. Very nice in fact. The EFW office for the day. Not bad eh!? The ICC World Twenty20 England 2009 Statistical Package. This free hand out to the press will provide me with my bog reading for the next eight months. Ahem; in the history of International T20 West Indies have won the toss and elected to field four times. They have won three of those four matches. That stat is on page 1 (one! ), there are 49 (forty-nine!) pages of this stuff. Heaven. Rishi Persad. Rishi is presenting the highlights for BBC2 during this tournament. 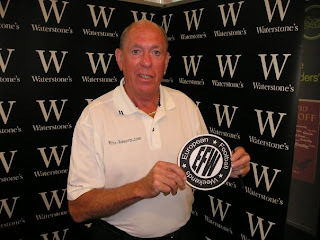 He was in our box for the morning and was happy to enter the EFW Hall of Fame. He regaled us with witty anecdotes and a very passable impression of Aggers which reduced me to a fit of the Tuffers giggles. ....and then entertains the watching millions. I didn't get to meet my heroes. There is a school of thought that says you should never meet your heroes in case they turn out to be a radish. So I can sleep safe at night still thinking that Aggers, Blowers and Bumble (who were tucked away on the other side of the press area) are top draw. Unlike Nasser Hussain by the way, more of him later in the lowlights section. At precisely 12:56 I helped myself to a free danish pastry. Again, what's not to like!? Press pass the size of a bus (tick). The Oval Hum. You can't beat cricket for a good 'hum' around the ground. As play commenced 23,500 excitable conversation took place culminating in a crescendo of noise upon the first swish of Graeme Smith's enormous bat. You only get this at cricket and I love it. The South African fielding. Professionals at work or what!? They were like tigers in the field, running here, there and everywhere, backing up, backing down, running backwards, pirouetting. The star of the show was AB de Villiers fielding at backward point. Watching great athletes perform at their peak is worth getting up for. New Kids on the Block. We arrived expecting big performances from Brendon McCullum, Chris Gayle and Shahid Afridi and we departed purring about Wayne Parnell's inswinging yorkers, Lendl Simmons big hitting and man of the day Umar Gul. Gul bamboozled the Kiwis with his reverse swing recording the best ever figures of a T20 International in the process. Five wickets for six runs in three overs. Outstanding. The Oval clock. I don't want to start getting all misty eyed about a clock *eyes fill up with mist just thinking about it* but they've put a bit of effort into their clock and I for one appreciate it. Misty eyes across the nation - it's The Oval clock. Derek from Super Sports South Africa and Emmet from the Irish Times. Very pleasing to know that there are guys in the media who are generous with their time, friendly and extremely good company. These chaps shared my box for the day and I salute them. In between running onto the pitch to interview South African players Derek fondly recalled his curry eating competition with Wayne Parnell. Cheers lads. Derek. Presenter with Super Sports South Africa. Mini chicken and mushroom pies with herbs (herbs!) handed out in the box willy nilly just before the end of the South African innings. Chris Gayle's shades. Only he can pull off wearing a pair of yellow rimmed sunnies and still end up looking Daddy cool. Rudy Kirsten. The job of the third umpire must be one of the best jobs on the planet. During a 'tv referral' Rudy was given the task of either hitting the 'Out' or the 'Not Out' button after seeing umpty thrumpty replays in slow motion. It's not hard is it!? Kirsten hit the 'Not Out' button in error on one occasion. Tucking into some mini chicken and mushroom pies (with herbs) were we lad? Enterprising West Indies fans. Two blocks of them watched their match with South Africa and then softened the blow of seeing their heroes lose by walking outside and selling on their tickets to some very enthusiastic Pakistan fans for the following game. Not strictly speaking legal but a situation that ended up with everybody being happy. Just as we like it. No such thing as a free lunch eh!? In between matches I helped myself to a plate of the following; lemon sole, chargrilled vegetables, pasta, posh bread (with optional butter, yes please) and a selection of cold meats. Jesus H Christ you could have even had Salmon! Seven overs into the New Zealand innings. Sun shinning on a full house at The Oval, best seats in the house, Boom Boom Afridi bowling, Styris launching sixes into the crowd, can life get any better!? Yes it can. News filtered through that the Dutch had released their fixtures for the 2009/10 season. There is a God. Mental note to self 'Must organise EFW Oktoberfest'. Due to our high vantage point we could just about make out bendy red buses going down the Harleyford Road. One for Blowers. Talking of Blowers (as I often do), he would have loved the 50 or so pigeons who enjoyed their day enormously on the outfield. They were only briefly disturbed when Boom Boom sprinted twenty yards, running backwards (backwards!) to take the catch of the day to dismiss Styris. The waving of the white flag. Despite half promising to myself that I was going to have a beer free day, I didn't quite manage it. Mr Fuller and I cracked and relaxed the no beer policy by popping next door into one of the empty executive boxes. We sank a couple of pints and watched Amar Gul's record breaking bowling spell returning only after he'd picked up his fifth wicket courtesy of a leading edge from Kiwi Kyle Mills. Braaaaavoooo, Mooooorrrkeeel, Affffriiiidiiiiii. What you don't see on the telly is the fact that the crowd adopt the player fielding next to them as their own. Players love it/milk it, fans love it and cult status is assured for the day. Good old cricket. Maybe I'm a victim of TMS (Test Match Snobbery) but I'm no fan of artificial noise in sports stadiums. Clappy sticks and hooters should be'filed under bin' and whilst I'm dispatching things into Room 101, can you make room for those giant cardboard Pepsi Max hands!? Many thanks. There was a time when a boundary was greeted with a ripple of applause and the occasional cry of 'lovely cover drive old chap'. Fast forwards to 2009 and you get an ear piercing blast of Song 2 by Blur, dancing women and men on podiums and more clappy stick/hooter noise pollution. I'm obviously in the minority here because the crowd lapped it up all day long. (yeah get with the times Grandad - Ed). 14:12. 42 minutes into play and the mexican wave starts up. Runs coming at 9 an over, shots flying all around the ground, dropped catches, thrills and spills aplenty and yet we feel the need to engage in the mexican wave. Erm...why!? Can we not wave goodbye to this? Chris Gayle and Brendon McCullum out for 5 and 12 respectively. Crowd denied some biff, bang and plentiful amounts of wallap. shame. Gayle departs for just the 5 runs. The Hall of Shame. Here we go then. 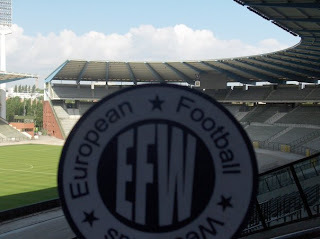 We've only ever been refused two photographs with the EFW logo in our lifetime. Once was a very moody Steve Harmison and now we have another entrant. Step forwards Nasser Hussain. Picture the scene: midday at the Oval with barely a sole in sight. I politly ask Nasser for a word. 'What do you want?' came the reply complete with a frown the size of bus. A quick photo for the website please Nasser. He couldn't have walked off quick enough. Too big for your boots are we Nasser!? Up your own arse are we son!? Think you are bigger than Jesus do we!? Won't do anything unless you are told or moreover paid!? Lost your sense of humour have we!? Shame on you. Actually, I still quite like him. Didn't mind chatting to the blonde though did we Nas! ?